He represented an island of hope in a sea of turmoil. The katha has to be viewed in the backdrop of a Gujarat tearingly polarized by the 2002 train carnage, subsequent statewide communal riots and the venom spitting Gaurav yatra undertaken by the then chief minister, Narendra Modi to widen the wedge and cash it for a steamroller majority in the approaching state Assembly elections. India too faced similar predilections riddled as it has been with caste and creed fracas and Mandir-Masjid divides Rich dividend for the power seekers but at a colossal cost to Gujarat and India. Narayanbhai was aware of the fact that the social fabric of the state had been irretrievably damaged and had reached a level where Muslims were finding difficulty in getting jobs, Hindus won’t rent out homes to them and the like. Religious conversions and ‘ghar-wapasis’ may be exercising the national conscience but few would be aware of the fact that a hindu –muslim marriage in Gujarat requires permission from the district collector and that purchase of property in areas dominated by the other is subject to similar clearances. This not only encourages clannishness but is aiding ghettoisation. Hindu-muslim community living-from the slum to the elite- now just does not exist. The only place one could see it is in the Vedchhi Ashram where Narayanbhai lived near Bardoli in Surat district of South Gujarat. The solar kitchen and the community dining was a sight for sore eyes. The food was kept in utensils in the centre and all sat together for a meal, and washed ones own utensils at the end of it. Every chore was a community task. Natural dyes colour handspun cloth for simple apparel and the ample library is a readers delight. 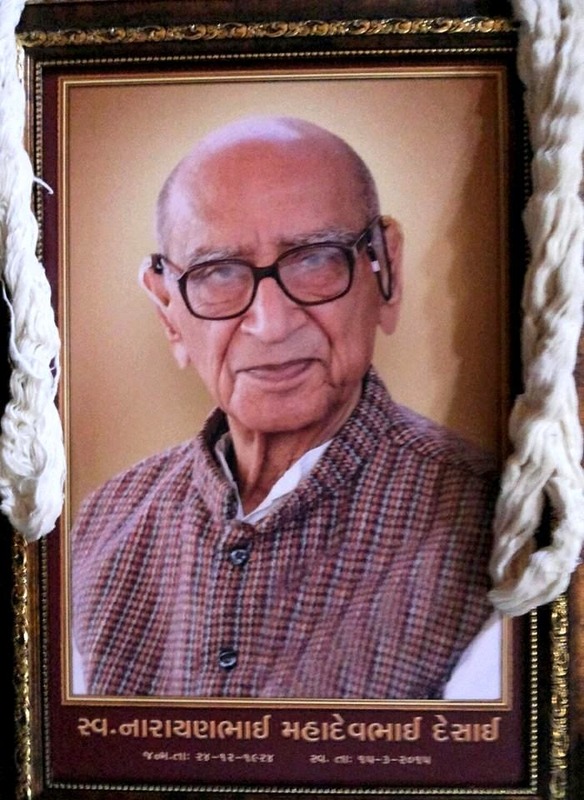 The son of the Mahatma’s secretary, Mahadevbhai Desai, who was the chancellor of the Gujarat Vidyapith and gave it up of his own volition, Narayanbhai was privileged to grow up in Gandhiji’s presence(he called him "bablo") and imbibed his principles and way of life first hand. Narayanbhai’s wife Uttara was the daughter of the first Chief Minister of Orissa, Nabhakrushna Choudhury. Though married September 12,1947, Narayanbhai who had courted her for long, had begun learning oriya almost an year earlier. He also wrote to his wife- to- be in oriya . Notebooks of his initials attempts at ingesting the language were found in his personal belongings, his journalist-son , Nachiketa revealed. Interestingly when Gandhiji had visited Orissa in 1936, he made it known that he would not enter a single temple where harijans were not permitted. Thus it was that, the Mahatma did not visit the Jagannath temple though he stayed at a place nearby. Kasturba and Durgaben (Mahadevbhai’s wife), however did and when the Mahatma came to know of it, he was livid with Mahadevbhai who even desired to quit on the plea that he was not worthy of Gandhi because he had failed to persuade the two women from the temple visit. Narayanbhai, then a 12 year old,aware of the Mahatma’s resolve, accompanied kasturba and his mother upto the Jagannath temple but did not enter it. The eminent Gandhian has left behind a treasure trove in the shape of his diary. He had begun writing a daily diary from age 16 in 1940 and continued to do so until the night of December 9,2014, hours before slipping into a coma. He had a premonition his end was nearing. At night, he had wanted the oxygen mask removed, saying that he felt much better without it. He also beamed on arrival of son Nachiketa who had been away to Mumbai on a short errand when he returned well past midnight. The end came just about three hours later. Narayanbhai Desai was staunchly opposed to any self-commemoration and did not favour erecting statues or building memorials, his family has therefore decided against it, not even at his Vedchi ashram. One sincerely hopes that those who seek to build memorials to themselves in the name of the Rs 500 crore Mahatma (Gandhi) Mandir convention centre in Gandhinagar or the Rs 2000 crore proposed Sardar Patel statue of unity at Kevadia colony, may take note. Former chief minister Chimanbhai Patel’s Samadhi in Gujarat’s state capital, Gandhinagar could also provide a point to ponder over. Even next of kin visit it only once a year. Most of the time he sleeps alone, with hardly a visitor ever, to disturb him other than on special occasions. Mortals crave memories but time is a remorseless teacher!